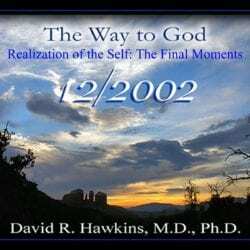 In “Devotion: The Way to God Through the Heart”, Dr. Hawkins begins this lecture with “Today we are going to talk about that which cannot be spoken about”. This pathway of Love is extraordinarily powerful, with the capability of sweeping all capacity to function aside. Love takes a thousand different forms, from the more personal to Enlightenment and most people are more loving than they realize. It may be expressed as duty, commitment, caringness, and even love for the body. In its spiritual form, it is an awareness of a Reality that is within you at all times. You begin to see Love everywhere; it is constant in our lives and he invites us to nurture those parts of ourselves. Enlightenment is merely identifying progressively with the infinite Self, realizing that one is all that is forever. Dr. Hawkins also speaks of the many traditional pathways of Devotion through the heart. He explains what true forgiveness means and the importance of the developing the powerful capacity to let go of anything; the willingness to surrender all attachments to God. This is just a small portion of the amazing Truths revealed in this wonderful seminar! Excellent lecture on surrender and letting the things go that obscure the Love of God. One of my favorite of the 2002 series!